Rental Rate: $120 a day. 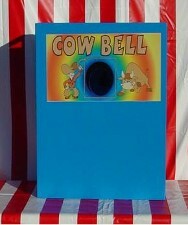 The cowbell carnival game is a beanbag toss. If you throw the beanbag into the hole you ring the cowbell. The Game is 28x9x32inchs tall and weighs 50lbs. Comes with cowbell and 3 beanbags. Equipment delivery, set-up, and staff operation are available all over the USA. Contact Dallas Carnival Game Rentals today to schedule your next rental! If you do not see the specific item you are looking for, please contact us. We have a wide range event gear available that are not specifically listed on this website. 8% will be added to all pickup orders and events, we do not have a tech at during the event to cover our damage waiver. Dallas area.. extra travel for outside a 20 mile radius. Delivery/setup/pickup extra based on the order size. Staffing, game prizes, and game prize ticket redemption tables are also available. STAFF/GAME PRIZES/DELIVERY/SETUP AND PICKUP IS EXTRA. MOST GAMES HAVE TO BE DELIVERED AND SETUP BY US.